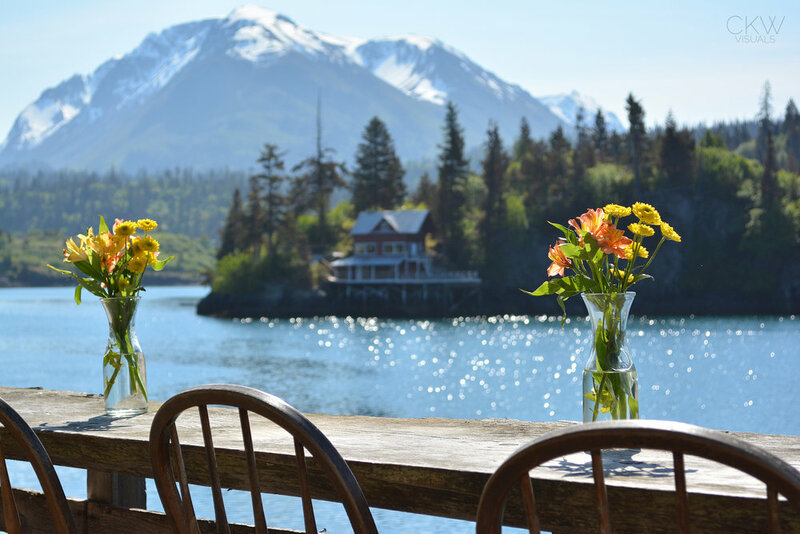 Located on Ismailof Island in Halibut Cove, Alaska, The Saltry Restaurant opened in 1984 with the mission statement - Art on the face of the wilderness and fine dining. Since then, we have been serving both quality interpretations of classic dishes and daring new ventures into the uncharted territories of food. When the perfect building to house an island eatery presented itself, Marian and Dave Beck acted instantly to acquire the unique structure that became the Saltry Restaurant. A U-shaped dock was constructed in preparation for the Saltry’s arrival. Moving day was chosen for its twenty-three foot tide, the highest of the season. When the tide was at its highest point, the barge was eased into the U-shaped opening. As the tide dropped, the empty barge eased down and away with the tide. Pilings were erected from the beach at low tide to brace the Saltry from underneath. If you look at the dock around the Saltry now, it’s possible to see how it sits not quite square, how its final settling place is slightly caddywhompus. The Saltry first opened its doors in April 1984. Eighty people arrived for the celebratory potluck, despite the howling blizzard of rain and snow. At its inception, the Saltry provided simply fare: drinks at the bar, hot chowder, fresh bread and cold appetizers-such as pickled fish- that are still on the menu today. Today, the Saltry serves about 100 people everyday during the summer season, dishing out gourmet food from a kitchen decidedly more sophisticated than in 1984. 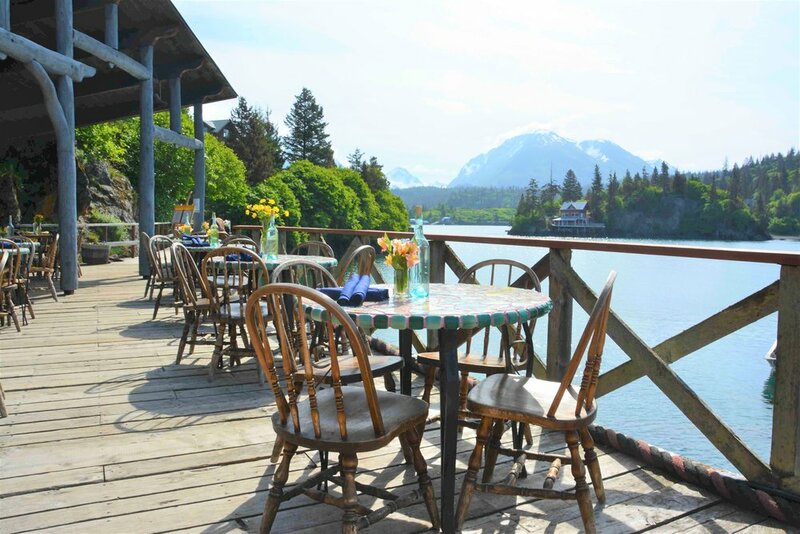 What hasn’t changed is the incredibly beautiful setting of the Saltry, with its view of the mountains and glaciers from its perch above the water, and the desire to bring the freshest fish and oysters straight from Kachemak Bay to your table. We are now taking reservations for our 2019 season! May 25th through September 1st. Reservations are required. The Danny J Ferry carries 29 passengers. In addition to the Danny J, we sometimes operate the 45 passenger Stormbird. All vessels are Coast Guard approved and licensed. Modern docking facilities make it easy for anyone to get on or off the boats, although the ramps to and from the boats can become steep during low tides. Kachemak Bay Ferry reserves the right to substitute another vessel for the Danny J as conditions dictate. Special charters are available upon request. To read trip descriptions and prices, please visit the Danny J Ferry page. The Saltry's vast majority of seating is outside, rain or shine. We do have an awning to shelter you from the rain, but please wear warm and waterproof clothing to help keep you warm and dry. We are dog friendly! Dogs are welcome, no charge, as long as they are friendly and must remain on leash at all times! Please pick up your ticket at the office at least 30 min before your tour departs. The Danny J/Saltry Restaurant Booking Office is open from 9-5 daily and is located on the Homer Spit. Once you have picked up your ticket you will be directed to Ramp 1 where the Danny J docks. The booking office is located about 3.8 miles out Homer Spit. We are on the last boardwalk on the left (same side as the harbor) before the Salty Dawg (the lighthouse). There is a large yellow sign on top of the boardwalk that says "Bald Mountain Air". We are right next door to Bald Mountain Air in a small orange building. Please stop in and say hello to our Greeter "Archer"! West Ismailof Island is private - water taxis do not service The Saltry. If you would like to request a reservation , please fill out the following form and we'll get back to you as soon as possible. This is a RESERVATION REQUEST. It does not GUARANTEE a reservation. Reservations are made based on availability. Danny J Ferry reservations are required unless you will be coming in by private boat. If arriving in your own boat, please enter your boat's name. Please tie up at The Saltry's dock, right below the restaurant. IF YOU NEED TO CANCEL YOUR RESERVATION, PLEASE CALL 226-2424 BEFORE 5 PM.- WE APPRECIATE IT! Refund Policy for groups of less than 10 passengers; Cancellations made more than 5 full days in advance will be refunded, less a $5 per ticket cancellation fee. Cancellations with less than 5 full days' notice will not be refunded. Refund Policy for groups of more than 10 passengers; Cancellations made more than 10 full days in advance will be refunded, less a $5 per ticket cancellation fee. Cancellations with less than 10 full days' notice will not be refunded. NO SHOWS will not be refunded. If the tour is cancelled for any reason, a full refund is guaranteed.